Kakadu National Park is considered a must see for anyone visiting northern Australia. It is on the "to do" list of most Australia visitors, and so it should be. The park has a lot to offer. To get the most out of a visit to Kakadu requires either a lot of time or some insider knowledge. I can't give you more time than what you have available for your visit, but I can help with the insider knowledge! Facts about Kakadu NP gives you all that background information about size, location and management, habitat and nature, climate, Aborignal culture etc. How to get to Kakadu and how to get around. 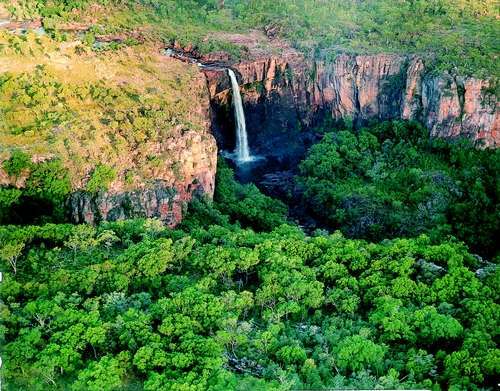 And here is a quick tour through Kakadu National Park to show you what there is to see and do and where everything is. Another good way to get a first overview is to download the official visitor guide. It doesn't have any detailed information, but it has good maps and listings of where everything is located. Kakadu attractions, Kakadu accommodation, camping in Kakadu, and here are some maps of Kakadu National Park. Ok, so much for official tourist information. Let's get to the details that they don't tell you about! Have you ever heard or read that line? Or seen a comment like this? "They should call it Kaka-don't. It's not worth going. Go to Litchfield. That's much better." Believe it or not, those comments are not unusual. Many tourists leave Kakadu very disappointed! The reason is that most people grossly underestimate the size of Kakadu National Park. They don't take enough time and they don't do any research. A day or even overnight trip can't do this place justice. I consider three days the minimum and five days or more would be adequate. But obviously that is not possible for most tourists. So, if you have little time, should you even go? Kaka-do or Kaka-don't? Travel In Kakadu National Park: How, When, What? What is the best time to visit Kakadu National Park? The official answer is June to August, but there is always more than the official answer... And on the next page you can find out more about what you can and can't do during the wet season in Kakadu. Kakadu tours or self driving? Some people ask me in emails if I think they have to join a Kakadu tour. Have to??? You don't have to do anything! If tours are not your thing, don't do it. It's as simple as that. 2WD or 4WD for Kakadu? Been To Kakadu Or Plan On Going? Share your thoughts and experiences. Let us know if Kakadu lived up to your expectations or exceeded them. Maybe you can share a great tip on how to make the most of a visit? Have a great photo? A video? Of course we'd love to see them, too! Enter the title of your Kakadu story or tip. Trip To Kakadu National Park, Litchfield and Katherine Gorge. 4WD Or 2WD?